Look at incandescent bulb w/ spectroscope. Draw what you see and describe in words. 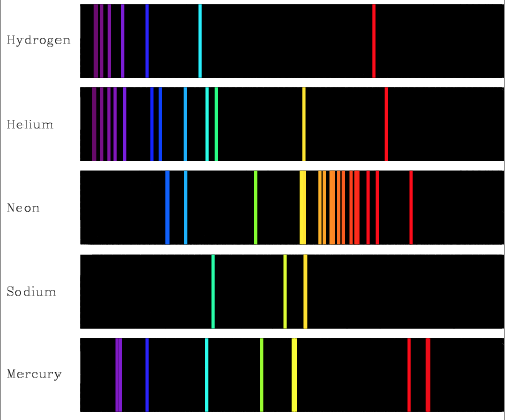 Why is this called a continuous spectrum? Look at the pink sheet w/ spectroscope. Why is this called an absorption spectrum? Look at the gas tube w/ spectroscope. Why is this called an emission spectrum? Look at gas tubes A, B, & C w/ spectroscope. Draw what you see. Use spectra provided (pictured above) to identify each gas. Use the spectra provided to determine which elements listed are in the solar spectrum. 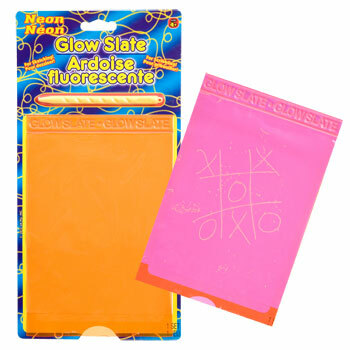 The “pink sheet” that produces an absorption spectrum is the pink plastic from a “neon glow slate.” I got mine years ago, but it seems similar to this one that Dollar Tree is selling. It absorbs yellow light, so when looking at white light passing through it, you see a continuous spectrum with the yellow part missing. Astronomy: Today we did a false-color image activity. You may use only 4 different colors. 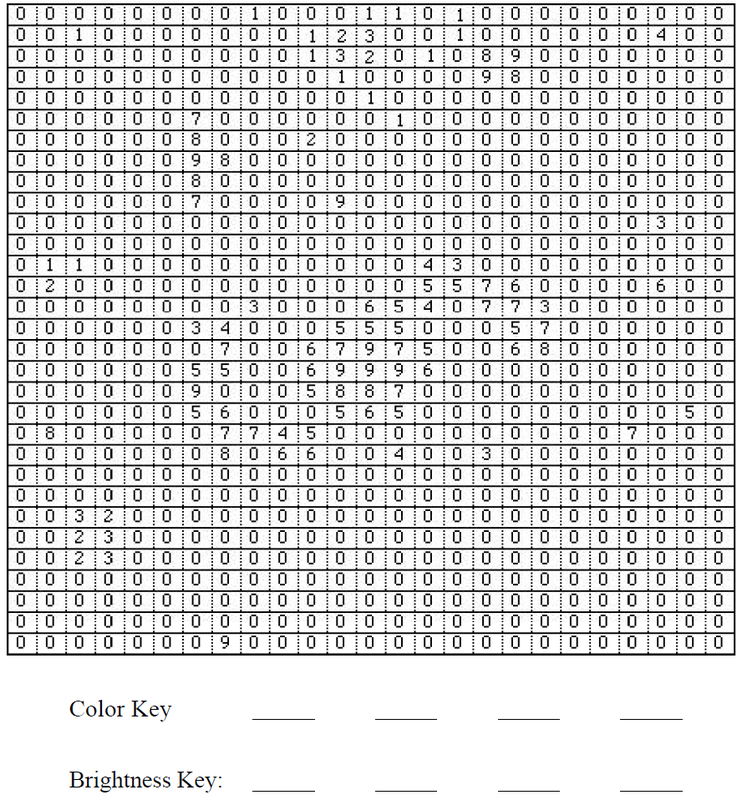 Assign each color a brightness key. What is different and what is the same as you look at everyone’s picture? Compare the pictures in terms of the pros and cons of using different color palettes. When you choose a different color palette, do the data change, or do we just see the data differently? Explain. Use duct tape. The tape needs to be under A LOT of tension. Weaker tape will just rip. Buy an extra box of candy. We would’ve had about 5-10 more sticks if kids didn’t sneak a few candies to eat. Put an extra layer of tape over the duct tape. (Non-duct tape is fine.) It keeps the skewers from sliding off at large amplitudes. What is the scale of the E-S-M system? 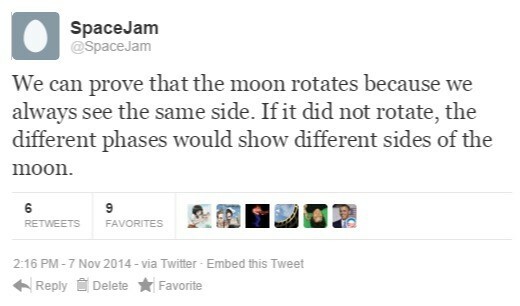 How does the sun rotate? 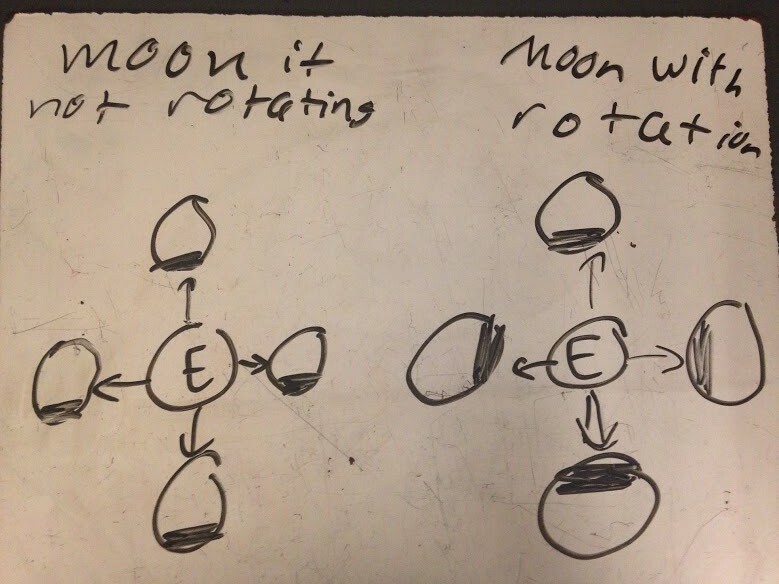 How does the moon rotate? What causes the moon phases? How does Earth go through phases? What was the importance of the lunar cycle in ancient cultures? Each post/tweet/etc. must have a model to illustrate the concept. This model may be photos of a physical model (preferred) or a diagram you create. You may NOT copy/paste images directly from the internet, books, etc. Astronomy: First we used Stellarium to keep track of Mars’s location in the zodiac each month for a whole year. Then we used stoppers to model the motion of the Mars against the constellations as seen from Earth (animated GIF above). Handouts: Planetary Motions Star Chart and Retrograde Mars Model. 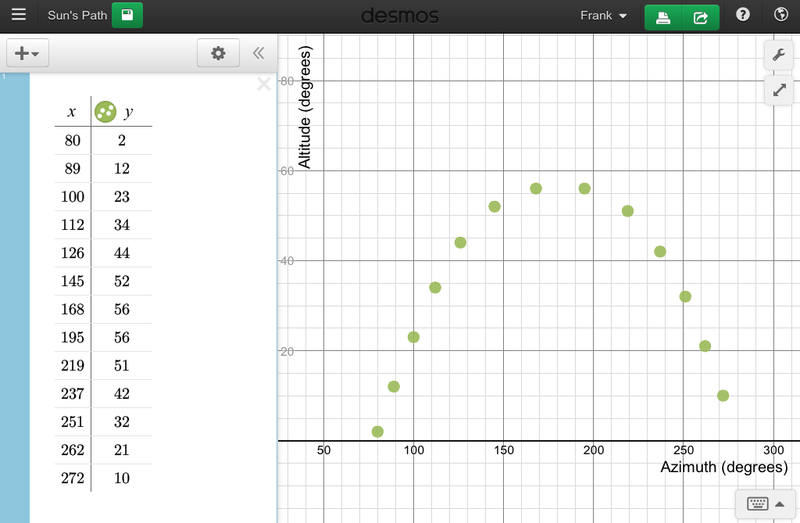 College-Prep Physics & Astronomy: Students used Desmos for the first time today in both classes. 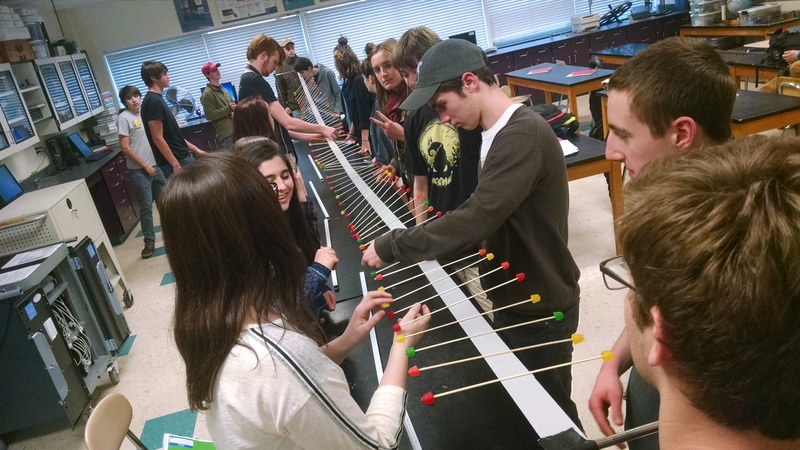 Physics students graphed their Buggy Lab 2 data, while Astronomy students graphed their sun path data. Astronomy: Clouds today prevented us from tracking the actual path of the sun outside. 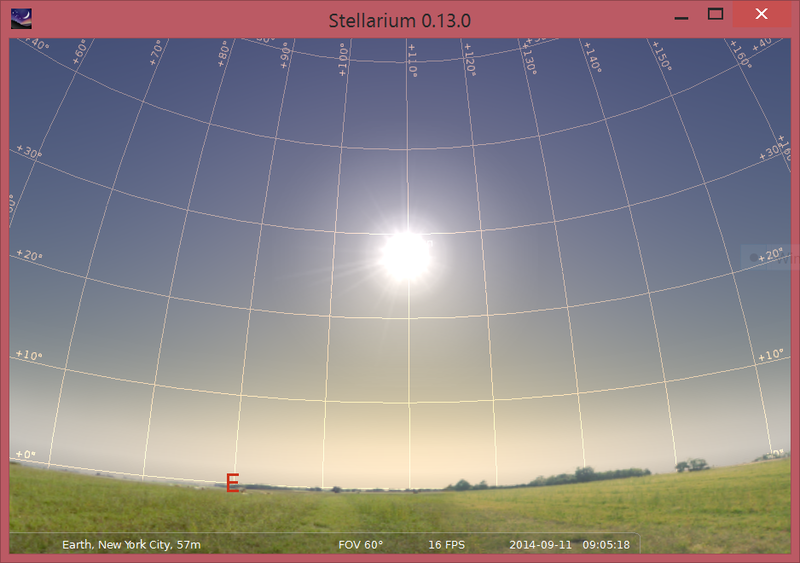 So we fired up Stellarium to track the azimuth and altitude of the sun. Each group was assigned a different month during which to track the sun on the 15th of that month. Groups had to find the time for sunrise on that day, and then track the sun for each hour after sunrise until the sunset. 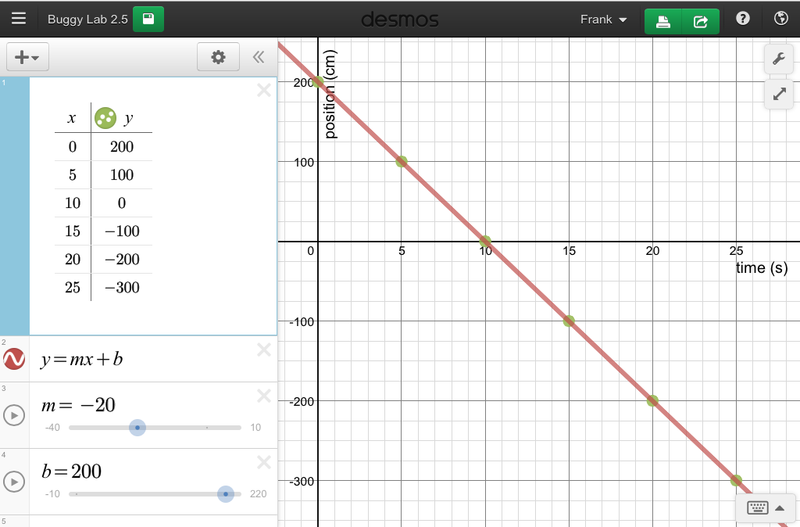 Tomorrow, we’ll graph our data in Desmos and look for similarities and differences between each group’s graph. 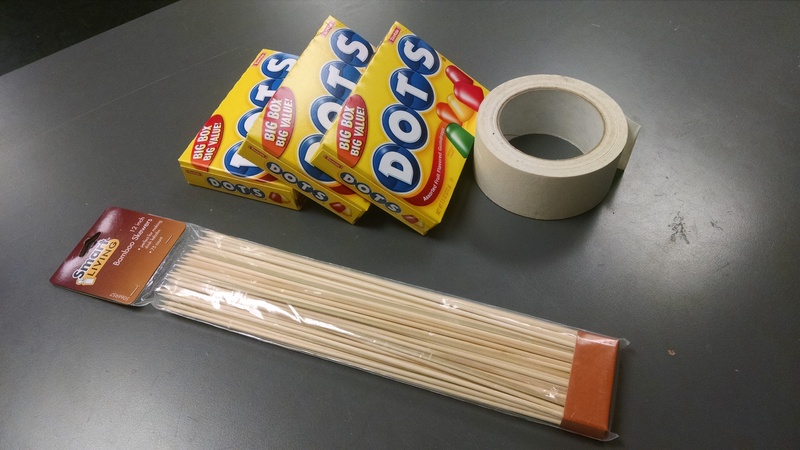 NGSS Science and Engineering Practice 3: Planning and Carrying Out Investigations.